The firm was honored to host Herbert Quelle, German Consul General (pictured on left), and Monsignor Michael Boland, President and CEO of Catholic Charities of the Archdiocese of Chicago (pictured on right), for a discussion on the global refugee crisis. 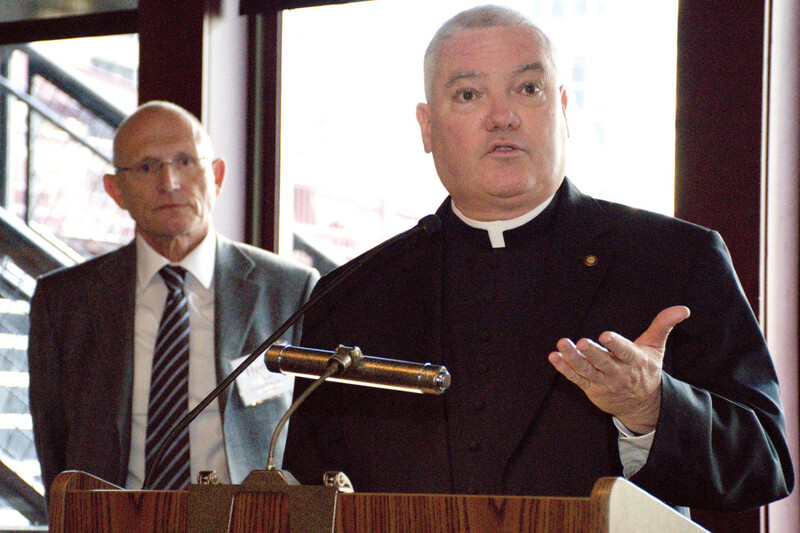 The discussion was held on November 23, 2015 at River Roast in Chicago, as part of the regular luncheon series on contemporary issues sponsored by the firm’s Religious practice. The world is today witness to the most dramatic mass migration since the Second World War, as millions are driven from their homelands in Syria and beyond by war and violence, creating a crisis in European nations deluged with survivors. While some countries have opened their borders, others have been unwelcoming. Political and cultural tolerance for these newcomers, and political leaders’ abilities to ameliorate tensions are being sorely tested; social welfare organizations are simply overwhelmed. Consul General Quelle outlined Germany’s accelerated political and humanitarian response to the estimated 1 million refugees for whom Germany had become the “beacon of hope.” With 60 million globally on the move, Germany committed to accepting the equivalent of 1% of its existing population, even as they were “forced to improvise” orderly structures and procedures at its borders. German policies arose from humanitarian and pragmatic grounds. Msgr. Michael Boland presented a clear picture of the resources and work that are involved in settling and integrating refugees in the Chicago area. Refugees are admitted only after an extensive screening process that takes at least a year and often much longer. He stressed the importance of guiding newcomers toward jobs and education, of parish and community support structures, and of keeping families together as they assimilate and progress toward self-sufficiency here. From direct financial support to housing to schools to providing guidance on how appliances work, Catholic Charities provides relief and support throughout the immigration process for refugees. Msgr. Boland estimated that about $25,000 is typically spent in the process of settling a family in Chicago. Consul General Quelle and Msgr. Boland provided practical perspectives on the European refugee crisis and how the United States can participate in relief efforts. Many thanks to both presenters as well as to the attendees. Those interested in contributing to relief and support efforts can do so on the consulate website or through Catholic Charities.